Pratt, Verna E. 1989. Field Guide to Alaskan Wildflowers. Alaskakrafts Publishing, Anchorage, Alaska. Paperback. 136 pgs. This is the basic guide for Alaskan wildflowers by a recognized expert. It's especially good for beginners ( like me), because the plants are grouped according to the color of their flowers rather than their family. You see a blue flower. Flip through the photographs of blue flowers and chances are you will visually identify the plant right away. Of course, the wildflower has to be blooming to use this method, but that's not really a problem for most of the summer. Besides, most of the photographs show the leaves and detailed descriptions of the plant are given. Come the fall, you will recognize the plants you saw blooming during the summer. 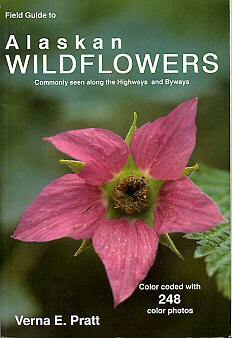 Some ferns and trees are included, but the book is really aimed at wildflower identification. Species descriptions are clear and similar wildflowers are noted as well as blooming times and habitats. Poisonous and edible species are clearly noted. This is a thin, inexpensive book easy to stuff in a pack and easy to use.